I work with a lot of athletes struggling to correct very overextended lower back and anterior tilted pelvis positions. In itself, I really don’t think a little bit of overextension and forward hip position is a huge deal. However, when it becomes really exaggerated and the athlete loses their ability to reverse this posture it can often create performance (reduced power output, non ideal shaping, poor force absorption) and injury issues (lower back pain, muscular overuse, landing based knee/ankle pain). Second and in line with this, there are a few pieces to the puzzle that go beyond just hip flexibility. For me, it is a combination of alignment first (Mike Reinold credit), then flexibility/mobility, then basic strength training for the hips and core, then building this into compound movement patterns (squat, jump, sport skills, etc), then proper training techniques, and finally proper maintenance care. Taking it back to the first category of alignment, I think that positional breathing drills are some of the simplest ways to help out combatting a very over arched position. These breathing drills are aimed to help depress the rib caged to a more neutral position, rotate the pelvis backward posteriorly, round the lower spine into a flexed position, and reduce muscle tone in the lower back and front of the hips. When used properly, they can be part of a program to help deal with too much extension. There are many great drills I have picked up (I by no means claim invention credit), but these are two of my favorite and most commonly used. There are many great drills I have picked up (I by no means claim invention credit), but these are two of my favorite and most commonly used. I very frequently put these in the beginning of an athlete’s custom warm-up program or before mobility circuits. For this, have the person curl up into a very tight rounded shape, with the knees blocking the ribs and legs together. The hands can go behind the head, and then while keeping this position take a deep breath in the nose for a 3 count, and out for a 6 count. The goal is to breath “back and out” of the ribs to help promote getting out of the very arched position. Focus on slow, full exhales for 5 breaths. The exhale should be long and full, when done properly the abs kick on quite a bit. The idea of this drill is very similar to above, but I think that it allows a little more active muscle contraction to assist. The athlete will stand with back flat to the wall, arms out in front, and hips tucked under (a “dog tucking its tail” analogy works well with younger athletes). Again, they will breathe in their nose, and upon the exhale they will focus on reaching the arms forward to a rounded shape, engaging their abs to round their lower back, and engaging the glutes to help tuck under further. Again, full slow exhales are the goal. I actually use this daily before my own training, so I snagged a video of me showing it. I’m sure many people have seen versions of the hip lift drill, some more corrective based and others more awareness based. This is a version I am a fan of more specific to shaping based sports like gymnastics, so don’t go nuts in the comment section. This version has the athlete on their back, lifting their hips to engage the hips, trying to maintain rib position as the arms elevate overhead. There are good progressions with having the person elevate on a mat to reach full overhead position, or using resistance to slowly control core position. All are great when applied properly. You can also do a banded version that helps transfer over to an extension or overhead skill well, I use it frequently as a corrective and side station. 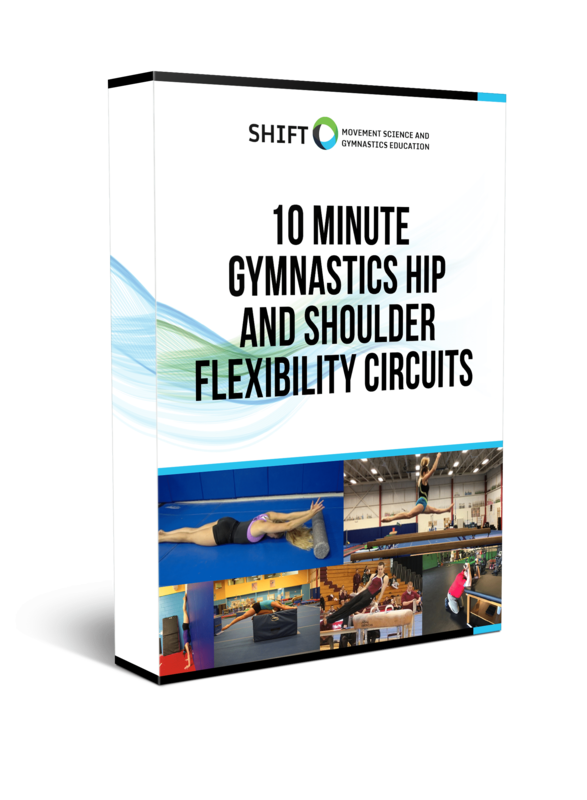 Naturally, if you are in the gymnastics domain you can progress this type of exercise to mimic handstands, and really challenge properly hollowed positions. There is a massive nerdy rabbit hole to travel down centering more on nervous system state, diaphragm position, and overall biomechanical “correction” having its own issues. If people are interested in diving in more, there are a lot of great resources from people like Leon Chaitow, Sue Falsone, the PRI folks, and more. Definitely, do some Google digging if you are a nerd like me. For all sports and general fitness athletes, I think it’s important that we monitor the normal adaptations that come through training and not let them get so far gone that they negatively affect performance or start to create overuse injuries. I really follow the “U-Curve” type thought process, that the posture and movement adaptations fall somewhere in the mid-ground, not too much or not too little. There are a lot of smart people in the PT world who argue that lacking a baseline level of movement variability may excessively start to excessively stressing certain areas, and negatively impact their strength or sports skill training. For now, give these a whirl and add in some more of your favorite drills after. Hope it helps!